My link to the internet being refurbished. Some time ago, my link to the internet was threatened when a car hit a telephone pole (I wasn't there at the time but I think there were no injuries). 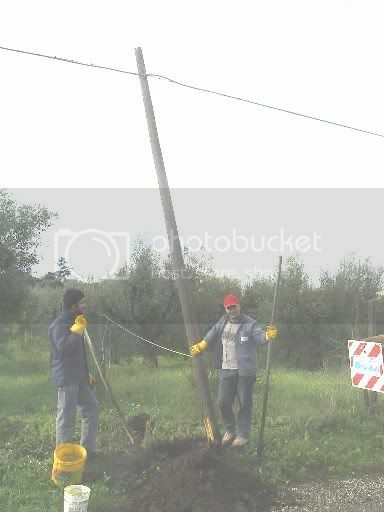 The broken pole was held up with twine for a while (see the white twine in the photo) and I was planning to photograph it for a funny post post on the variety of the internet. As ususal I left things till the last possible moment. These two nice guys from telecom Italia are making sure that I will be able to continue bloggin (I forgot to get their names).